i saw a recipe on pinterest that i couldn’t resist – donut holes! i have been wanting to make donut holes for ages, but always thought they would be too complicated. so when i saw this recipe claiming they took only 15 minutes, i had to give it a try! it probably took about 30 minutes in reality, but still much easier than i would have thought. i fried them on the stove instead of getting out the deep fryer, so i didn’t have a way of knowing the temperature of the oil. it was definitely too hot when i started them just above medium, so the first few cooked too much on the outside and didn’t quite cook fully inside. i lowered the stove to medium and that did the trick – it took probably about 3 minutes for them to get golden brown and cooked fully in the middle. i coated some with cinnamon and sugar, and some with powdered sugar. i didn’t wait long enough for the powdered sugar ones – they were still too warm, so the powdered sugar started to liquify and they ended up a little goopy. still delicious, though! 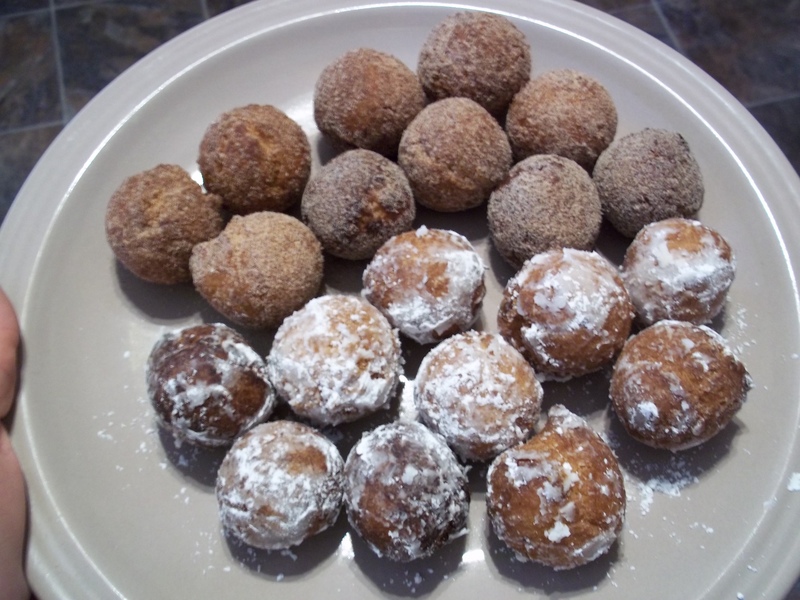 This entry was posted in Baking and tagged baking, deep frying, dessert, donut holes. Bookmark the permalink. Thanks, they were pretty tasty! Still can’t believe how easy they were to make, either!